Exiting Yantic Street, drivers should turn right, and take the first right back onto Sachem Street. At the traffic light, turn right onto Washington Street, and follow ½ mile to School Street on the left. 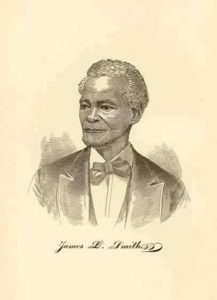 James Lindsey Smith was born into slavery in Virginia. A boyhood leg injury proved to be a mixed-blessing because his permanent limp rendered him unable to keep up with the rigors of field labor. After numerous experiences on land and sea, he was apprenticed to become a shoemaker, which led to: A) his embracing Christianity during his after-hours; and B) self-emancipating (i.e. 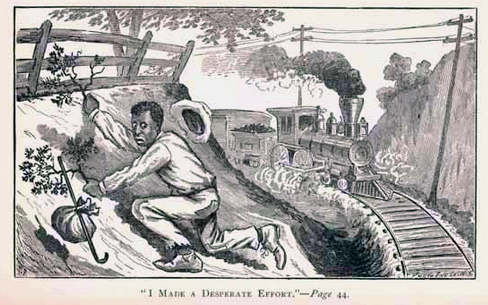 escaping) via the Underground Railroad to freedom in the north. When he reached New York City, he was assisted by Norwich native David Ruggles (see Stop #11 below). Mr. Smith eventually made his way to Norwich and settled there with his wife and family, preaching the gospel and teaching Sunday School at the Methodist Church. He greatly added to the history and cultural fabric of Norwich by being the first self-emancipated African-American to own property in 1845 – at 59 School Street – a relatively new house built circa 1843. The brick house next door (# 61) is the one in which he and his wife lived before purchasing #59 – paying off the mortgage in three years. Mr. Smith’s autobiography, printed by the Norwich Bulletin in 1881, provides first-hand insights into his journey, describing the emotional extremes he experienced, and graphically illustrates the contrasts between the trials and tribulations of slavery, with the hope and joy, which resulted after his emancipation.